I'm a little slow on this one, but I want to write about this year's wonderful Richard Tucker. Here is a link. It should be up for a year. We start off with the current award holder Jamie Barton who sings "Acerba Volluta" from Cilea's Adriana Lecouvreur. This is a barn burner and she does an excellent job. She is very talented. Each singer has to talk after they exit. Then Piotr Beczala sings Puccini's "Nessun Dorma." There is chorus with this. If you want to know how it's going, just look at the faces of the singers in the chorus. His voice is showing some stress. Renée Fleming is shown briefly singing with Luciano Pavarotti. Then she comes out and sings "Io son l'umile ancella" from Cilea's Adriana Lecouvreur. The Renée, she always sounds so good. She recommends that you know your own voice. Can't argue with that. I complain constantly about people selecting repertoire outside their physical gifts, but Renée knows what is best for her. She was gorgeous here. Then Nadine Sierra comes out and performs a duet with Andrea Bocelli, the special guest of the evening. They sing the "Sulla tomba, Verrano a te sull'aure" duet from Lucia di Lammermoor. They actually look well together. He is beginning to both look and sound old. Sorry. There was a lot of complaining on line about him. Nadine genuinely seems to like him and they do well together. Cilea is having a big night. Stephen Costello then sings "E la storia solita del pastore" from Cilea's L'Arlesiana. This is very beautiful. Stephen's voice is developing nicely. "In quelle trine morbide" from Manon Lescaut is sung by Angela Gheorghiu. It's always nice to see Angela. The repertoire is all of a piece here, like something from the 30's. "Ebben, nel andro lontano" from Catalani's La Wally comes next, also sung by Angela. Perhaps she is the other guest star. This is just her stuff and she is in form. And now for something completely different. Isabel Leonard sings"Nacqui all' affano...Non piu mesta" from Rossini's La Cenerentola. Instead of sweetness, we have some spectacular vocal gymnastics with wonderful, original fiorature. I think this concert is designed to warm up as it goes along. Her ornaments are very original. I've seen her in Griselda so I know what she can do. This is excellent. Jamie, "You got all my friends. Thank you for that." Tucker person, "We tried to get your enemies, but you don't have any." Back to the concert. Jamie and Christine Goerke appear for a duet from Ponchielli's La Gioconda, "E un anatemal." We are back to singing big which is what the Tucker is all about. 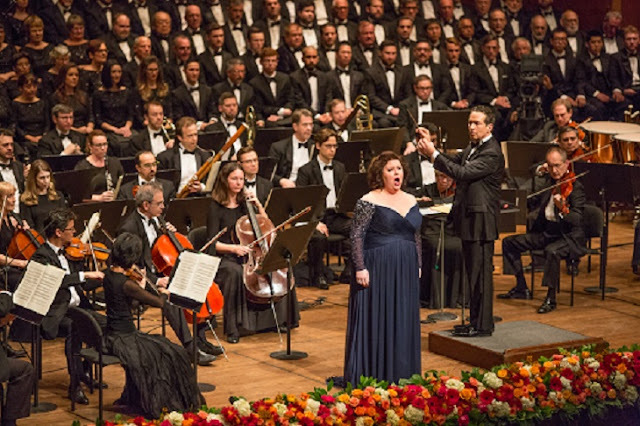 Goerke is the queen of big singing, and Gioconda isn't done nearly enough. Their voices are well matched. You won't hear it better than this. They come off the stage and do this incredible chest bump, as it they were the Bryan brothers (tennis). Lawrence Brownlee talks about lifelong learning. Gee I love him. That's why I can't really ever be a critic because I love them all too much. He sings "Terra amica" from Rossini's Zelmira. I don't understand the public's desire to trash people in places like YouTube comments. I'm only good for love. This one also has chorus. Larry tears into it. Rossini tenors are one of the wonders of the world. Nadine Sierra sings another duet, this time with Stephen Costello, this time "Va, je t'ai pardonee" from Gounod's Romeo et Juliette. She's singing 3 different roles at the Paris Opera next season. She knows her Gounod from her Donizetti. The great Christine Goerke sings Eboli's aria "O don fatale" from Verdi's Don Carlo. I don't know what she's doing singing something I used to sing. Perhaps a Verdi dramatic mezzo is coming. She completely aces this and has a much easier time with it than the average mezzo. The drama and the notes all come easily. Boccelli returns to sing "M'appari tutt' amor" from Flowtow's Martha. This song plays in my head in German, but in concerts it always appears in Italian. Perhaps that's why he is here. He sees the Richard Tucker foundation as a promoter of Italian music. I see it like that, too. We're almost finished and there has been only Italian and French singing. Renée Fleming and Piotr Beczala sing the love duet from Gounod's Faust, "Il so fait tard." Renée is outstanding in this, too. The audience is amazing and cheers for everything. The concert closes with Jamie Barton, she is really showcased here, singing "Adieu fiere cite" from Berlioz' Les Troyens. Is this something we should thank Susan Graham for? Perhaps. I am so glad to see the growth of interest in Berlioz' vocal music. Jamie is a singer to love. IMHO. All Italian and French, nothing before Rossini, nothing after Puccini. This is all classic Richard Tucker. A wonderful concert with several former winners and guests. It will be available on the PBS website for 3 years.